The U.S. government was never meant to be a giant lender for the world’s most powerful banks. "Furnish an elastic currency" is another way of saying that the Fed should be a "lender of last resort" - lend money to banks whose funding sources can suddenly disappear in financial crises in order to prevent the system from collapsing. The Fed was founded because the frequent financial "panics" of the late 19th and early 20th century made clear that the US needed a central bank to perform this function. During the financial crisis, the Fed performed this function with ingenuity and determination, and we would be in a very different - and much, much worse (think "Mad Max") - world if it hadn't. Americans are feeling inflationary pangs at home, too. The congressional Joint Economic Committee found that since the Fed launched its program of quantitative easing in late November 2008, the value (trade weighted) of the U.S. dollar has declined 14 percent, which translates into higher food and fuel costs. 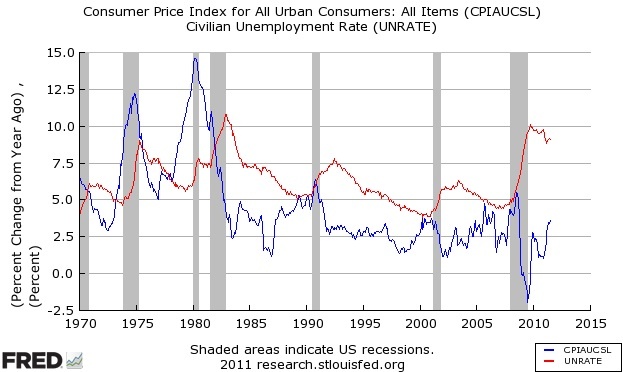 The graph below shows inflation, measured by the CPI (though I think a 'core' measure, which would show lower inflation recently, is a more appropriate guide for monetary policy) and the unemployment rate. By historical standards, unemployment is very high now, while inflation is low (and the little tick upward at the end will likely vanish as the effect of the oil price increase earlier this year dissipates). Leaders from around the world have openly complained about the way the U.S. is intentionally weakening the dollar, since doing so cheapens the value of U.S. debt they hold. After the second round of quantitative easing was announced, Chinese Vice Finance Minister Zhu Guangyao said America “does not recognize, as a country that issues one of the world’s major reserve currencies, its obligation to stabilize capital markets. DeMint appears to believe that US monetary policy should heed the criticism of foreign government officials. Perhaps the mandate of the Fed be changed to focus on the interests of other countries. I think some people may believe that it should, since the US dollar is the global "reserve currency", but if we're going to do that, we might as well abolish the Fed and turn US monetary policy over to the United Nations. It doesn't appear that the wording of the Federal Reserve Act is explicit on this point, but I think its pretty well understood that the language quoted above about "the economy", etc., refers to the US economy. If they don't like our monetary policy, China and Germany (and everyone else) are free to choose other assets to buy. This San Francisco Fed Economic Letter from 1999 describes nicely how and why the Fed's mandate has evolved. It might be good reading for Senator DeMint. A Better Analogy for the Deficit? The debt ceiling debate showed how hard it is for the political system to deal with something that can be good in some circumstances, bad in others. I hope this is a way of thinking of it that is simple and intuitive, but also right. Of course, the ideal is to simultaneously have an expansionary policy now, but also a plan for a (roughly) balanced budget in the long run (i.e., after the economy has returned to health). But the debt ceiling fight illustrated how raising the issue of long term projected imbalances starts a big fight over the ultimate size of government (which isn't what countercyclical policy is about). 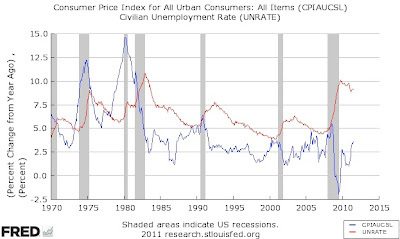 With 14 million people unemployed - and interest rates very low - that is a dangerous distraction. Time to Cash in the Fed's "Credibility"? Update (8/12): Rogoff explains his thinking more in this FT column. A Silver Lining to the Debt Ceiling Fiasco? So China, the largest foreign buyer of US government paper, will soon say, “enough.” Yet another vacuous budget deal, in conjunction with weaker-than-expected growth for the US economy for years to come, spells a protracted period of outsize government deficits. That raises the biggest question of all: lacking in Chinese demand for Treasuries, how will a savings-strapped US economy fund itself without suffering a sharp decline in the dollar and/or a major increase in real long-term interest rates? The US should hope he's right. An abrupt reversal would be very disruptive, though it would probably do more harm to China than the US (provided the Fed steps in to limit the increase in US interest rates). But China's massive purchases of US assets aren't a benefit to the US overall - they are part of a policy that has distorted the US economy away from tradable goods production and towards excess homebuilding (and asset bubbles). The reason China has accumulated gigantic holdings of US Treasuries is that it has been intervening in foreign exchange markets - selling renminbi for dollars - to keep the value of its own currency down and the dollar up. It then invests the dollars in Treasuries (i.e., the Treasury bond holdings are a consequence of the foreign exchange policy). The result is US-produced goods are more expensive relative to Chinese goods. This contributes to the trade imbalance and reduces the size of US exporting and import-competing sectors. Furthermore, many other countries feel the need to undertake similar interventions to maintain competitiveness vis a vis China, so it is not just the bilateral trade balance that is affected. China has adopted a very transparent response. Its new 12th Five-Year Plan says it all – a pro-consumption shift in China’s economic structure that addresses head-on China’s unsustainable imbalances. By focusing on job creation in services, massive urbanization, and the broadening of its social safety net, there will be a big boost to labor income and consumer purchasing power. As a result, the consumption share of the Chinese economy could increase by at least five percentage points of GDP by 2015. If the debt ceiling mess has given China's leadership a greater sense of urgency to get on with that, that's a good thing for them, and for us. Roach's column came out before the S&P downgrade, but that may have reinforced China's views. That is, the downgrade has as much to do with the US political system as it does with debt levels. The ugly spectacle of a faction of one political party taking the economy hostage in the debt ceiling debate has trashed the rating agency's (and everyone else's) confidence in Washington's ability to make difficult compromises. Arriving the day after a stock market plunge set off renewed talk of a "double dip" recession, the July employment report almost looks good because it is merely bad. 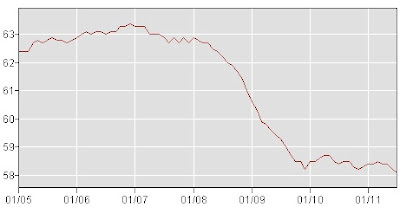 According to the BLS, in July the economy added 117,000 jobs and the unemployment rate ticked down to 9.1% (from 9.2%). Employment growth of 117,000 is just about the "treading water" level needed to keep up with population growth and productivity improvements, so it doesn't represent any progress in digging out of a deep hole. Government continued to be a drag - private employment rose by 154,000, but government jobs fell by 37,000 (of which state government accounted for 23,000, which the BLS says was "almost entirely" due to the Minnesota shutdown). Also, the employment growth figures for May and June, which had contributed to the economic fears, were revised up to 53,000 and 46,000, respectively (still quite bad, but better than 25,000 and 18,000 previously announced). The decline in the unemployment rate was due to people leaving the labor force, not job gains - in the survey of households (different from the survey of firms from which the headline jobs number is calculated), the number of people employed fell by 38,000, but the number of people in the labor force fell by 193,000. 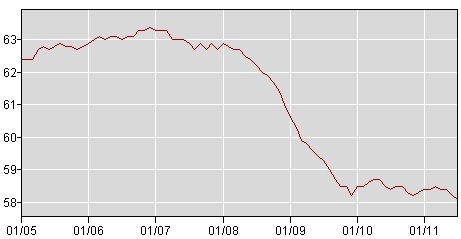 The labor force participation rate therefore decreased, as did the employment-population ratio.